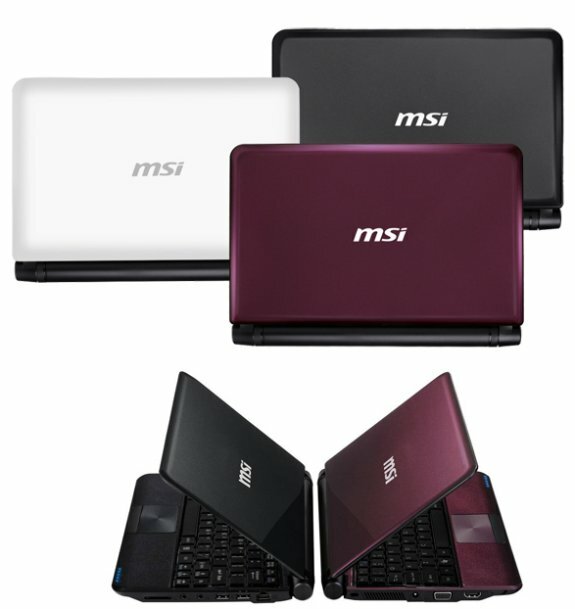 MSI introduced the Wind U180, a new 10" netbook with Intel's Atom N2800 (1.86GHz) or N2600 (1.6GHz). This Windows 7 Starter system offers Intel GMA 3650 integrated graphics, up to 2GB DDR3 (one slot), a 1024 x 600 pixel resolution, 250/320GB HDD, SD/MMC card reader, two USB 2.0 ports, HDMI, 802.11b/g/n WiFi, Bluetooth 3.0+SH, 0.3MP webcam, and a 3-cell battery. MSI unveiled its all-new powerful Wind U180 for 2012. This ultra thin, ultra light netbook features Intel's new generation, power-sipping, high performance Cedar Trail Atom processing platform packed in a snazzy chassis. It boasts twice the processing and display performance of the previous generation netbook as well as eight hours of battery power, so it doesn't run out of energy before you do. In addition, it comes with MSI's own TDE overclocking technology to maximize processor performance. The Wind U180 strikes the ideal balance between performance and style as well as between technology and art. Taipei—The Wind U180, meticulously crafted by MSI for 2012, marks a new zenith in computer technology, offering both performance and an esthetically pleasing looks. It comes in minimalist black, angel white or lavender, is less than one-inch thin, tips the scales at just 1kg, and is sheathed in MSI's own attractive IMR color film print to prevent scratches and smudges. Let this highly mobile piece of computer technology add color to your life. Eric Kuo, associate vice president for global sales, MSI Notebook, points out that the MSI Wind U180, a new generation netbook characterized by painstaking attention to craftsmanship and innovation, not only packs significantly more power, it is the ideal solution to meet today's mobile multimedia needs. Its display is some three times more powerful than that of the previous generation, enabling the high resolution LED screen to show much more detail and color. What's more, the HDMI slot allows you to connect the U180 netbook to a large HDTV to maximize multimedia entertainment. Intel's Atom processor: The stylish MSI Wind U180 netbook comes optional with the new generation dual-core Intel Atom N2800 processor with advanced 32nm-based process which works in conjunction with the Intel NM10 high-speed chip set. It not only effectively enhances processor and overall system performance by more than 20% over previous generation netbooks, it also supports DDR3 system memory, while using much less power than the earlier platform. This new generation netbook brings high performance under the hood of a lean, mean, beautifully constructed machine. All-new media engine: The MSI Wind U180 utilizes the latest generation display graphics technology, enabling it to play high resolution 1080p movies, and it supports digital display and conferencing capabilities, such as HDMI. The internal Intel Graphics Media Accelerator works in conjunction with the integrated memory control to boost performance and system response. The display graphics performance is double that of the previous generation platform. You can watch movies or hook it up to an HDTV without compromising picture quality. MSI TDE overclocking technoloy: The MSI Wind U180 comes with MSI's own epoch making TDE overclocking technology to speed up the processor clock, instantly throttling up performance. It optimizes the hardware which works in coordination with up to 2GB of DDR3 system memory to provide you a light and fast computing experience. Chic, slim, light exterior: The Wind U180's ultra slim, ultra light netbook sports a unique display axle and offers you a choice of minimalist black, angel white or lavender chassis protected from scratching and wear by the attractive IMR color film print. The palm-placement areas are sheathed in an attractive gleaming cover which adds to the overall elegance of the MSI Wind U180. Unique Chiclet keyboard: The MSI Wind U180 has a stylish Chiclet keyboard with independent key design for quieter, more solid action. With each strike of the keyboard, you will understand that MSI truly does insist on the best in each and every detail. Swirl design touchpad: The Wind U180 employs MSI's own swirl design touchpad which gives the keyboard area a stylishly minimalist look and enhances touch detection for smoother cursor movement. Super thin 10-inch LED screen: The MSI Wind U180 sports a power-saving 10.1" LED backlit display with a response time of just 8 milliseconds—more than twice as fast as traditional notebooks, to give you a smooth, crisp picture with greater detail and brighter colors when watching movies and animation. This netbook offers the visual quality of a cinema. MSI's ECO power saving technology: MSI's exclusive ECO engine power saving technology allows you to select from among five power management levels—Video Game, Film, Presentation, Word Processing, and Turbo Battery, with the touch of a finger, so you can effectively extend battery power time 33% over the previous generation. Tests show that the 6-cell battery can power the MSI Wind U180 for 8 hours to give you all the power you need for the entire day. *Actual battery time will vary with differences in computer use and settings. Bluetooth and wireless network support: In addition to providing 8 hours of battery power, the MSI Wind U180 also supports a complete array of wireless connectivity with 802.11 b/g/n wireless and Bluetooth 3.0+HS, making connecting with the world simple. Enjoy advanced future mobile computing technology today.